Hauntings associated with movie productions is nothing new. The Exorcist, Poltergeist, and The Omen are among the most oft-cited examples of sets allegedly plagued by paranormal activity. But even a more recent production such as The Conjuring supposedly dealt with strange happenings. 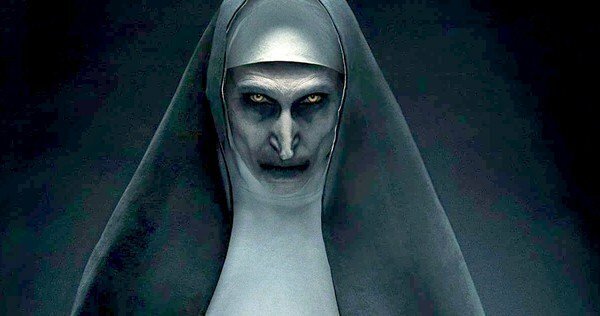 Which makes it all the more fitting The Nun, the upcoming horror spinoff to The Conjuring, has also had some spooky visitors on its Romanian set, according to director Corin Hardy (The Hallow). In an interview with Cinema Blend at last month's San Diego Comic-Con, Hardy said he encountered two shadowy figures who hung out as he directed a scene in an old fortress. Describing the structure as an old bunker that used to store weapons, with "pitch dark tunnels you could get lost in," the director said everyone was unnerved by the area. Still, that feeling didn't get personal until he was shooting a sequence called the "corridor of crosses." Half an hour later… I finally got the shot… I got up and turned to the two men and said, ‘Did you see that?’ And I turned around and… there was just no one in the room. And there hadn’t been anyone in there at all. There’s nowhere they could’ve come out of. I saw them on the way in. I just felt that they were there the whole time. Hardy went on to say he assumed the ghostly figures must have been Romanian soldiers, watching over the production. Of course, if you believe in ghosts, it is easy to think that the spectral residents of a castle may as well stick around to watch a movie being filmed. Another theory holds that shooting a movie involving supernatural elements, as does The Nun, could attract such entities. Similarly, if a production is filming rituals to channel ghosts or demons, another theory is that it's the same as performing the real deal. Then again, having a ghost story to help promote your movie is also just good publicity. Whatever the story, I am certainly looking forward to checking out Hardy's The Nun when it drops Sept. 7. He is a gifted filmmaker, and I highly recommend his elemental/faerie horror flick, The Hallow (you can read my 2015 interview with him here). Check out the trailer and official synopsis for the movie, and let me know your favorite haunted movie set story.